I hope everyone had a great holiday with plenty of good food, fun and family! This morning we had a hearty cereal of steel cut oats. I've made them before the over night method, but this worked just as well. Melt 2 tablespoons of butter over medium heat, add 1 cup steel cut oats and toast for about 2-3 minutes. Add 3 cups boiling water, stir and reduce to a simmer, gently simmer for 25-30 minutes, stir occasionally. Stir in 1 cup milk (I didn't have milk so I used coconut milk) and cook for 10 minutes until the milk is almost absorbed stirring 1 or 2 times. It will keep up to 3 days in refrigerator. My daughter had a friend over so I let them decide what they wanted on their oatmeal. My daughter like cinnamon and brown sugar. Her friend had coconut milk and honey. I had cardamom, dried Michigan cherries, coconut, coconut milk, sunflower seeds. You can enjoy it with any fruit, nuts, berries, or sweetener...that's the fun of making it your way! ..close up! It's pretty cool! Gary made a beef roast and potatoes. ..
...they are from South Africa so they don't have family in town at Christmas either. Maranda, playing with some toys that we get in the Christmas crackers...and that is sparkling cider she's drinking. Some other goodies that were in the crackers...the kids at school will love them! Another friend Sarah joined us and she brought her dog too. So we had four dog with us at Christmas...we couldn't leave them home...well 2 belong here and we brought Tucker, and Sarah brought Sadie the Lab was welcome too. They all got along fine and were so well behaved. 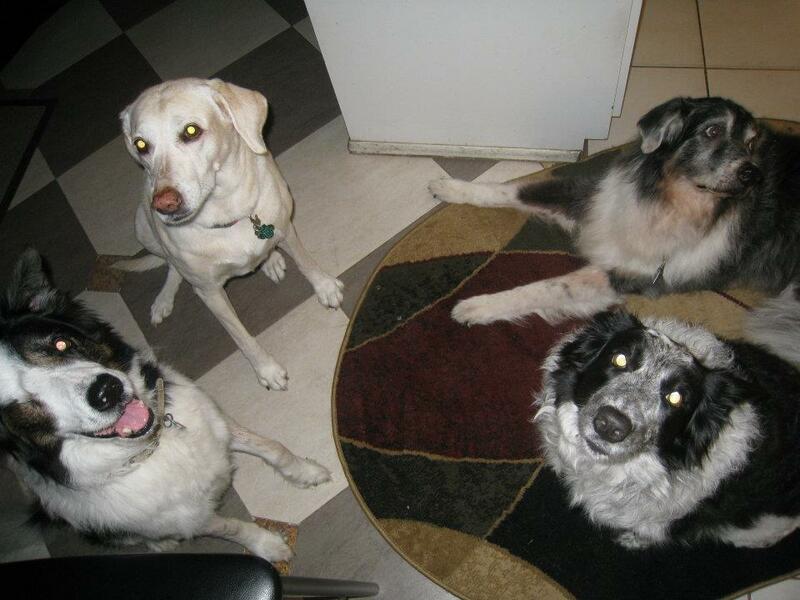 Jeanne did a good job getting them all together for the photo...with treats in hand! This time of year my lemons are in full swing...good thing, I used it all week for my ginger, tea with lemon and honey. I used my new Tervis Tumbler (made right here near us in Florida) I got it for Christmas from my aunt and uncle. It's perfect for keeping drinks warm or cold. .., another sunset walk on the beach, (ha! caught them off guard). it was a really nice evening...this was Monday the day after Christmas. We've been having perfect weather lately. The sunset wasn't that spectacular, but we saw some dolphins as soon as we got there. They are so hard for me to catch a good photo of , but they are always so cool to see, I never get tired of it! Hope you all had a wonderful week! Looking forward to the New Year to come, and visiting you all. Back to school (work) tomorrow, and here I thought I'd get more done than I did. Will post more soon! This is indeed a wonderful breakfast with our own add in! Nice photos especially the sunset, wishing you and family a Happy and Prosperous New Year! A perfect start. Nothing like steel cut oats on cold mornings. Looks like a lovely evening for all! Hello Lyndsey, Happy New Year 2012! Dear Lyndsey, I really enjoyed reading your post of the Christmas holiday. I also love that everyone brought their dog! They really all looked so happy they weren't left home. The Florida Christmas looks soothing and nice. The roast pork looks really Good! I like the steel cut oats too. They are supposed to be real good for you too. I have a hard time with oatmeal...I think your toppings would help! Great picture of the snail. Wishing you the best in the new year. Sounds like you had a wonderful holiday! Loved the roast and all the trimmings and starting the day with oatmeal should be my New Year resolution! A big batch of steel cut oats sounds like the PERFECT way to kick off the new year! I love how they're customizable also...your topping choices sound awesome. That's a great start of 2012! I love that sunset photo. Awwww.....I love the pic of all of the dogs together...very cute! That is a great way to start the year. I've actually been meaning to pick up some steel-cut oats, lately...this'll give me the push I need, it sounds tasty! Steel-cut oats = 4 x's a week. Yep. Looks like a picture-perfect Christmas. Smiled at the pups and longed for a walk on a beach! a very happy new year to you, lyndsey! what a great and healthy way to start off a day! I read from your previous post that you were not feeling very well, i hope you are well by now and had a good time celebrating new year with your family and friends. That's a very clever shot of the dogs, looks like they were indeed posing for the photo! Cheers!! I've bought some steelcut oats a while ago but haven't used it yet... This looks really good! This is a healthy breakfast for a good start of a New Year! Your lemon is huge and look fresh. Thanks for sharing all the nice photos. Oatmeal is one of the few things that can make up for the cold. Looks great. And the dogs are so cute!!!! Happy New Year to you and your family! I really envy you grow your own lemon (and other fruits I`m sure)! The lemons I usually buy from the store near my house are imported from California, can you believe it?? What a great post! Love oatmeal and have not tried steelcut in a long time; think I willl pick some up on Friday. Your pork roast looks wonderful! What a fantastic sunset! Wishing yu all the best for 2012. I tried steel cut oats quite recently and enjoyed it a lot esp the texture after they are cooked. The nutty flavor seems deeper too compared to the rolled oats. I love steel cut oats because they are healthier and I want something that I could bite into. Happy New Year to you! Everyone's on healthy food after the festive binging lol! That's great food you've got there! nice photos too! That is a great start and I love the photos! wow...sensational & awesome post dear..
What a lovely holiday you had, and it looks nice and warm! How nice! The pork roast look amazing! It is amazing, Specially the four legged friend I have two of them myself. And what a perfect way to start your morning. Oh Lyndz, Maranda got her hair perm. Looks really mature, nice & neattoo. And love the unexpected photo too. Awesome view too. Sounds that everyone had a great time during the last X'mas. Frankly, I thought it was a restaurant if you didn't mention about your friend's house. haha.... I've been pretty slow lately. :o) Getting ready to travel home in another few more days. Hope you're having a great day, dear.